For Slavophone militias in Greek Macedonia during World War II, see Ohrana. The Department for Protecting the Public Security and Order (Russian: Отделение по Охранению Общественной Безопасности и Порядка), usually called "guard department" (Russian: Охранное отделение) and commonly abbreviated in modern sources as Okhrana (Russian: Охрана, IPA: [ɐˈxranə] ( listen), lit. the guard) was a secret-police force of the Russian Empire and part of the police department of the Ministry of Internal Affairs (MVD) in the late 19th century, aided by the Special Corps of Gendarmes. Formed to combat political terrorism and left-wing revolutionary activity, the Okhrana operated offices throughout the Russian Empire and satellite agencies in a number of foreign nations. It was concerned primarily with monitoring the activities of Russian revolutionaries abroad, including in Paris, where Pyotr Rachkovsky was based (1884–1902). The task was performed by multiple methods, including covert operations, undercover agents, and "perlustration"—reading of private correspondence. Even the Foreign Agency served this purpose. The Okhrana was notorious for its agents provocateur, including Dr. Jacob Zhitomirsky (a leading Bolshevik and close associate of Vladimir Lenin), Yevno Azef, Roman Malinovsky and Dmitry Bogrov. The Okhrana tried to compromise the labour movement by creating police-run trade unions, a practice known as zubatovshchina. The agency was blamed by the Communists in part for the Bloody Sunday event, when imperial guards killed hundreds of unarmed protesters who were marching during a demonstration organized by Father Gapon, who was alleged by the Bolsheviks to have collaborated with the Okhrana (though in fact this was unproven), and Pyotr Rutenberg. Other controversial activities included alleged fabrication of The Protocols of the Elders of Zion (many historians such as the German historian Konrad Heiden and Russian historian Mikhail Lepekhine maintain that Matvei Golovinski, a writer and Okhrana agent, compiled the first edition) and fabrication of the antisemitic Beilis trial. Suspects captured by the Okhrana were passed to the Russian judicial system. The Okhrana never received more than 10% of the police budget, the most it ever received being five million rubles in 1914. The first special security department was the Department on Protecting the Order and Public Peace under the Head of St. Petersburg, created in 1866 after a failed assassination attempt on Alexander II, with a staff of 12 investigators. Its street address, Fontanka, 16, was publicly known in the Russian Empire. After another failed attempt, on August 6, 1880, the Emperor, acting on proposals made by Count Loris-Melikov, created the Department of State Police under Ministry of the Interior (MVD) and transferred part of the Special Corps of Gendarmes and the Third Section of the Imperial Chancellery to the new body. The position of Chief of Gendarmes was merged with the Minister, and Commander of the Corps was assigned Deputy of the Minister. Still, these measures did not prevent the assassination of Alexander II in March 1881. In an attempt to implement preventive security measures, Emperor Alexander III immediately created two more Security and Investigation (охранно-розыскные) secret police stations, supervised by Gendarme officers, in Moscow and Warsaw; they became the basis of the later Okhrana. The Imperial Gendarmerie still operated as security police in the rest of the country through their Gubernial and Uyezd Directorates. 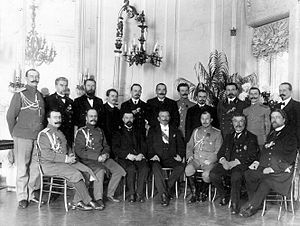 The Tsar also created Special Conference under the MVD (1881), which had the right to declare a State of Emergency Security in various parts of the Empire (which was actively used in the time of 1905 Revolution), and subordinated all of the imperial police forces to the Commander of the Gendarmes (1882). The rise of the socialist movements called for the integration of security forces. Since 1898, the Special Section (Особый отдел) of the Department of Police succeeded the Gendarmes in gaining information from domestic and foreign agents and "perlustration". Following the Socialist-Revolutionary Party's assassination of MVD Minister Dmitry Sipyagin on April 2, 1902, the new Minister Vyacheslav von Plehve gradually relieved Directorates of Gendarmes of investigation power in favor of Security and Investigation Stations (Охранно-розыскное отделение) under respective Mayors and Governors (who as a matter of fact were subordinate to the MVD Minister). The Okhrana used many seemingly unorthodox methods in the pursuit of its mission to defend the monarchy; indeed, some of the Okhrana’s activities even contributed to the wave of domestic unrest and revolutionary terror that they were intended to quell. Perhaps most paradoxical of all was the Okhrana’s collaboration with revolutionary organizations. Among the early Okhrana agents to work alongside revolutionaries was Lieutenant-Colonel Gregory Sudeykin of the St. Petersburg Special Section, who, in 1882, set up an illegal printing operation to publish the revolutionary People’s Will with Okhrana funds. Sudeykin and his colleague, a revolutionary-turned-police-informant named Sergey Degayev, passed drafts of the publication through Okhrana censors before printing. This episode marked the beginning of the Okhrana’s efforts to surreptitiously observe, but also influence and undermine, revolutionary movements. This focus on infiltrating and influencing revolutionary groups, rather than merely identifying and arresting their members, was intensified by the innovations of one Okhrana bureau chief, Sergey Zubatov. While P.I. Rachkovsky, as head of the Okhrana’s Foreign Agency, had long ordered Okhrana agents to infiltrate and influence revolutionary movements abroad, Zubatov brought these tactics to a new level by creating Okhrana-controlled trade unions, the foundation of police socialism. Perhaps recognizing the same discontent among factory workers that the Bolsheviks sought to exploit to start a revolution, Zubatov hoped the unions would mollify factory workers with improvements in working conditions and thus prevent workers from joining revolutionary movements that threatened the monarchy. To this end, Zubatov created the Moscow Mechanical Production Workers’ Mutual Aid Society in May 1901. After Zubatov was made head of the Special Section in 1902, he expanded his trade unions from Moscow to St. Petersburg and Southern Russia. Zubatovite trade unions achieved moderate success at channeling workers’ political agitations away from revolutionary movements and toward labor improvements, especially in the cities of Minsk and Odessa, with one high-ranking official noting that many revolutionaries and workers were joining the unions. However, Zubatov, if not police socialism, was discredited in the summer of 1903 after the Okhrana officer in charge of the Odessa union allowed a strike to get out of hand, causing a mass movement which paralyzed the region. Although the police-run unions continued to operate after Zubatov’s ousting, without Okhrana funding, they proved more a liability than an asset. The Assembly of Working Men, a police-run union with about 6,000–8,000 members, formed by the alleged Okhrana agent Father Georgy Gapon, sparked the Bloody Sunday massacre, a milestone in the Revolution of 1905, when union members marched peacefully on the Winter Palace in St. Petersburg and were fired upon by Imperial soldiers. The Okhrana complemented police socialism and other projects to prevent the conditions in which revolutionary movements could take hold by pursuing initiatives to curtail the activities of existing organizations. Yevno Azef, the notorious Okhrana provocateur who managed to become the head of the Socialist Revolutionary Fighting Organization, epitomized the Okhrana's inscrutable practice of revolutionary group infiltration. While the Okhrana managed to imbed many of its agents in revolutionary organizations, the police preferred to slowly gather intelligence and attempt to interfere with revolutionary work surreptitiously rather than immediately arrest known revolutionaries. This policy led to numerous dubious acts on the part of police spies, who needed to participate in revolutionary activities to avoid suspicion, as when Yevno Azef, as head of the SRFO, ordered the assassination of V. K. Plehve on July 15, 1904. For over twenty years, the Okhrana had focused on interfering with the activities of relatively small, and distinct, revolutionary groups. The Revolution of 1905, characterized by seemingly spontaneous marches and strikes, exposed the Okhrana's inefficacy at controlling mass popular movements. Not only did the Okhrana lack the capacity to prevent the mass movements of 1905, or even to contain them once they began, the Okhrana’s misguided attempts may even have worsened the unrest. D. F. Trepov, the Assistant Minister of the Interior in charge of police affairs, and P. I. Rachkovsky, now in charge of all domestic political police operations, attempted to mount an aggressive offensive against those they believed to be responsible for the unrest, namely zemstvo employees, in May 1905, but backed down three months later. In October of that year, Trepov again attempted a violent repression of the revolution only to call off the effort for lack of manpower. Since these attempts at repression never reached fruition, they only served to aggravate the already enraged Russian populace and to deepen their distrust of the Imperial government. Trepov’s replacement by P.N. Durnovo in late-October ushered in a period of even more vicious repression of the Revolution. Indicative of this new period is the head of the St. Petersburg Special Section, A.V. Gerasimov’s, strike on the St. Petersburg Soviet. To Tsar Nicholas II's delight, Gerasimov arrested delegates of the Soviet en masse on December 3, 1905. Along with this repression and the end of the Revolution of 1905 came a shift in the political police’s mentality; gone were the days of Nicholas I’s white-gloved moral police: post-1905 the political police feared that the Russian people were as eager to destroy them as to depose the Tsar. Following the outbreak of the 1905 Revolution and assassination of Plehve, Pyotr Stolypin, as the new MVD Minister and Chairman of the Council of Ministers, created of a nationwide net of Security Stations. By 1908, there were 31 Stations and more than 60 by 1911. Two more Special Sections of the Department of Police were organized in 1906. The centralized Security Section of the Department of Police was created on February 9, 1907; it was located on 16, Fontanka, St. Petersburg. The exposure of Yevno Azef (who had organized many assassinations, including that of Plehve) and Dmitri Bogrov (who assassinated Stolypin in 1911) as Okhrana double agents put the agency's methods under great suspicion; they were further compromised by the discovery of many similar double agents-provocateur. In Autumn 1913, all of the Security Stations but original Moscow, St Petersburg and Warsaw were dismissed. The start of World War I marked a shift from anti-revolutionary activities of the Department of Police to counter-intelligence; however, the efforts of the Department were poorly synchronised with counter-intelligence units of the General Staff and the Army. Just as the Okhrana had once sponsored trade unions to divert activist energy from political causes, so too did the secret police attempt to promote the Bolshevik party, as the Bolsheviks seemed a relatively harmless alternative to more violent revolutionary groups. Indeed, to the Okhrana, Lenin seemed to actively hinder the revolutionary movement by denouncing other revolutionary groups and refusing to cooperate with them. To aid the Bolsheviks at the expense of other revolutionaries, the Okhrana helped Roman Malinovsky, a police spy who had managed to rise within the group and gain Lenin’s trust, in his bid to become a Bolshevik delegate to the Duma. To this end, the Okhrana sequestered Malinovsky’s criminal record and arrested others candidates for the seat. Malinovsky won the seat and led the Bolshevik delegation in the Fourth Duma until 1914, but even with the information Malinovsky and other informants provided to the Okhrana, the police were unprepared for the rise of Bolshevism in 1917. Although the secret police had agents within the Bolshevik organization, other factors contributed to the Okhrana’s inefficacy at averting the events of 1917. Among these factors was the Deputy Minister of the Interior, General V. F. Dzhunkovsky’s ban on police spies within the military, a practice he found dishonorable and damaging to morale. While, initially, the beginning of World War I moved the Okhrana’s attentions from countering revolutionaries to countering German espionage, the focus quickly shifted back as it was revealed that the Germans were heavily funding Russian revolutionary groups in order to destabilize the nation. Despite the renewed attention, the February Revolution took the secret police, and the nation, by surprise. Indeed, the Okhrana’s persistent focus on revolutionary groups may have resulted in the secret police not fully appreciating the deep-seated popular unrest brewing in Russia. The Okhrana was identified by the revolutionaries as one of the main symbols of Tsarist repression, and its headquarters were sacked and burned on 27 February 1917. The newly formed Provisional Government then disbanded the whole organization and released most of the political prisoners who had been held by the Tsarist regime. Revelations of the Okhrana’s earlier abuses heightened public hostility towards the secret police after the February Revolution and made it very dangerous to be a political policeman. That fact, along with the St. Petersburg Soviet’s insistence on the dissolution of the regular Tsarist police force, as well as the political police, meant that the Okhrana quickly and quietly disappeared. Historians have claimed that despite the reforms in the early 19th century, the practice of torture was never truly abolished. Possibly, the creation of Okhrana led to increasing use of torture, due to the Okhrana using methods such as arbitrary arrest, detention and torture to gain information. Following the revolution, civilians claimed the Okhrana had operated torture chambers in places like Warsaw, Riga, Odessa and in a majority of the urban centres. ^ Corrin, Chris; Feihn, Terry (31 July 2015). AQA A-level History Tsarist and Communist Russia: 1855–1964. Hachette UK; Hodder Education; Dynamic Learning. p. 44. ISBN 9781471837807. Retrieved 8 November 2015. In 1881 a new secret police – the Okhrana – was established. ^ Bishop, Patrick (19 November 1999). "'Protocols of Zion' forger named". The Daily Telegraph (1638). Paris. Archived from the original on 28 May 2008. Retrieved 8 November 2015. Research by a leading Russian historian, Mikhail Lepekhine, in recently opened archives has found the forgery to be the work of Mathieu Golovinski, opportunistic scion of an aristocratic but rebellious family who drifted into a life of espionage and propaganda work. ^ Thatcher, Ian D. "Late Imperial Russia: problems and prospects," p. 50. ^ Fredric S. Zuckerman, “Political Police and Revolution: The Impact of the 1905 Revolution on the Tsarist Secret Police,” Journal of Contemporary History 27 (1992): 281. ^ Ronald Hingley, The Russian Secret Police: Muscovite, Imperial Russian, and Soviet Political Security Operations (New York: Dorset, 1970), 75–6. ^ Richard J. Johnson, “Zagranichnaia Agentura: The Tsarist Political Police in Europe”, Journal of Contemporary History 7 (1972): 226. Hingley, Russian Secret Police, 87. ^ Hingley, Russian Secret Police, 88–89. ^ Jonathan W. Daly, Autocracy Under Siege: Security Police and Opposition in Russia, 1866–1905 (DeKalb: Northern Iliinois University Press, 1998), 138. ^ Hingley, Russian Secret Police, 89. ^ Hingley, Russian Secret Police, 94–5. ^ Hingley, Russian Secret Police, 92. ^ Zuckerman, Political Police and Revolution, 281. ^ Zuckerman, Political Police and Revolution, 282, 5. ^ Daly, Autocracy Under Siege, 173. ^ Zuckerman, “Political Police and Revolution,” 285, 287, 289–290. ^ Malcolm D. Evans, Rod Morgan (1999). Preventing Torture. Oxford University Press. p. 13. ISBN 0-19-826257-4. Wikimedia Commons has media related to Okhrana. Guide to the Okhrana Records and photographs of activities and suspects online at the Hoover Institution Archives.